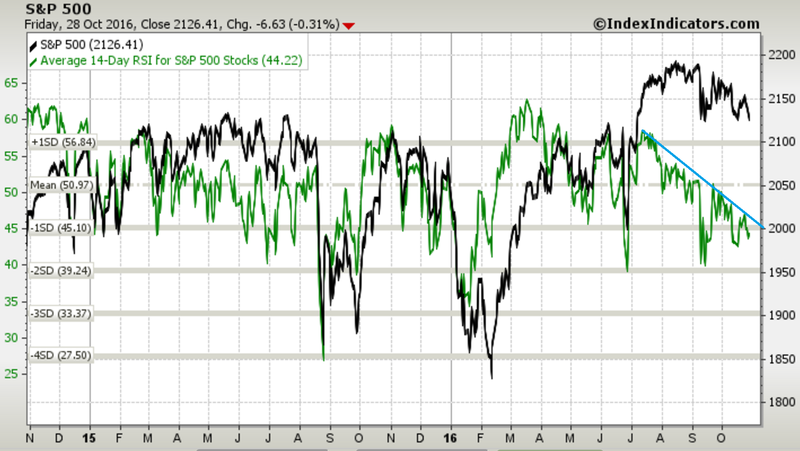 Bottom line: 50dma breadth continues to trend down, while the S&P500 is trading in a descending triangle pattern. 2. 52 week new highs minus new lows (52 week NH-NL): Another view of market breadth, the number of stocks making new 52 week highs minus those making new 52 week lows shows a similar down trend pattern. The logical conclusion if this downtrend line is not broken to the upside is a much deeper and broader correction. 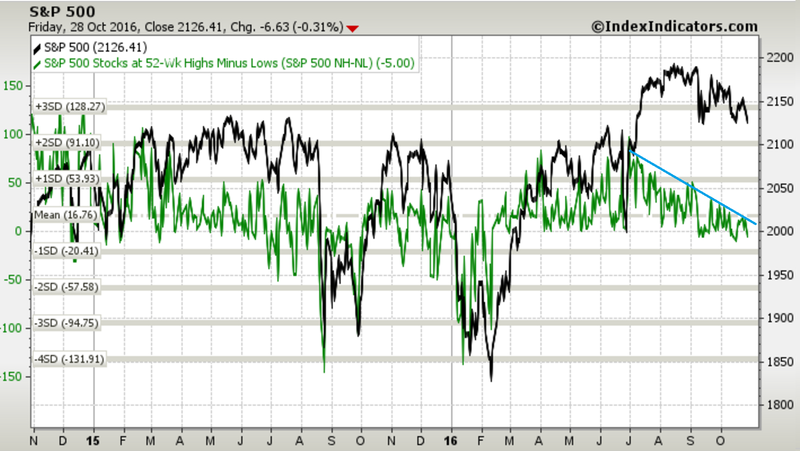 The deteriorating breadth indicators show weak underlying strength in the index. Bottom line: 52 week NH-NL also shows a downtrend, and if it's not broken to the upside the logical conclusion will be a deeper market correction. 3. Average 14-Day RSI for S&P500 Stocks: The average RSI across the S&P500 member companies provides what is essentially another view on breadth, and the downtrend line observed in the previous two measures of breadth shows up here as well. What's also notable is that you could say it's approaching oversold levels. Indeed this will be an important indicator to monitor for oversold buy signals, for now it shows the deteriorating momentum in the market. 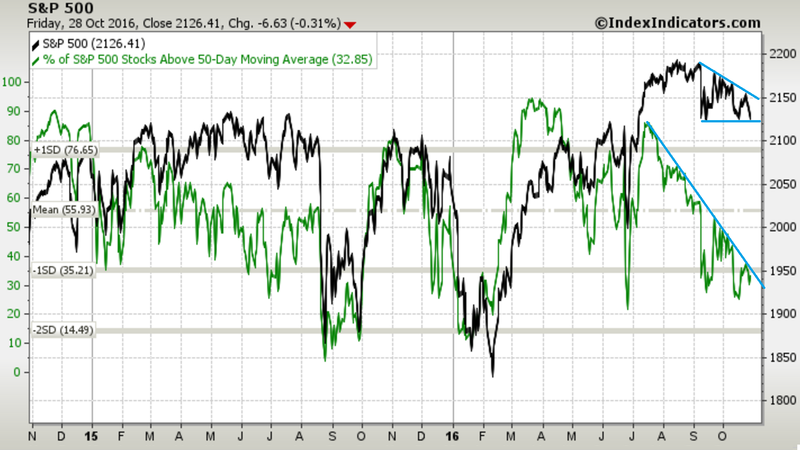 Bottom line: Average 14-day RSI for the S&P500 shows deteriorating momentum. 4. StockTwits Sentiment: StockTwits calculates sentiment indexes based on whether StockTwit members are tagging their tweets as bullish or bearish on the stock that their tweet is about. In the case of S&P500 ETF $SPY it shows the same downtrend line as in the breadth indicators as sentiment becomes progressively more bearish among member of the StockTwits community. Just like the breadth charts previously a break of that line will be bullish confirmation, whereas a continuation of the downtrend will likely be consistent with a broader and deeper selloff. 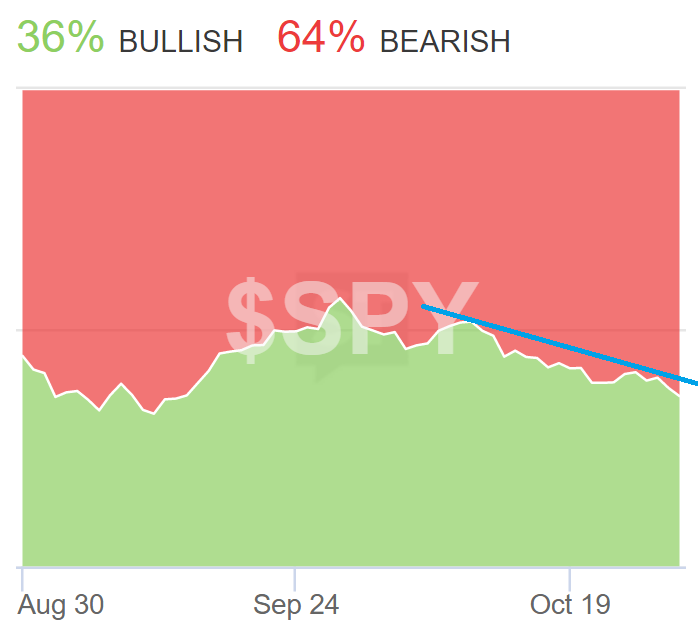 Bottom line: StockTwits sentiment is likewise trending down. 5. USDCNY vs the S&P500: As I explained in more detail over at SeeItMarket (VIEW LINK) the devaluation of the CNY (upward movement of the USDCNY exchange rate) has not caused the same aggravation to the S&P500 as it did in the last two major corrections (August 2015 and January 2016). This may be because it's mostly driven by the US dollar, but the bad news is if it keeps going at the same pace it probably will start to matter again. So keep an eye on this one. Bottom line: The USDCNY stopped mattering for the S&P500 - this may be a temporary phenomenon. Bottom line: Long term trends in bullish sentiment show very little recovery in bullishness, this could be a good sign. 7. Stock market seasonality: The S&P500 has been tracking its historical seasonal pattern very well so far this year, and this could be good news for the bulls (if there's any left!). This time of the year, the historical tendency has been that you tend to see solid positive performance. Of course seasonality is only one factor, and there are exceptions (e.g. 2008 was a major exception to this rule). Bottom line: Seasonality is now positive for the S&P500. 8. Improving earnings growth: The below chart shows the annual growth rate trends for trailing twelve month earnings and next twelve month earnings. After both went negative - a minor earnings recession - they're now on an improving track. So the big question will be how far can this earnings recovery go? The reason this question is so important is because if earnings growth does pickup meaningfully it will serve as a key fundamental support to any further upside in equities. And I probably don't need to tell you what happens if it doesn't pickup. Bottom line: S&P500 earnings growth is on an improving path. 9. S&P500 3-Month Trading Range: This chart from a fellow charting maestro, Charlie Bilello (VIEW LINK) , shows how the 3-month trading range of the S&P500 has collapsed and contracted to a boringly historical low. But quiet markets can be very interesting as low volatility is often a good predictor of future higher volatility. The typical path for greater volatility is through a bear market or major correction, but volatility can also trend up during more erratic and euphoric bull markets. So yes it's a boring market, but it probably wont stay that way. 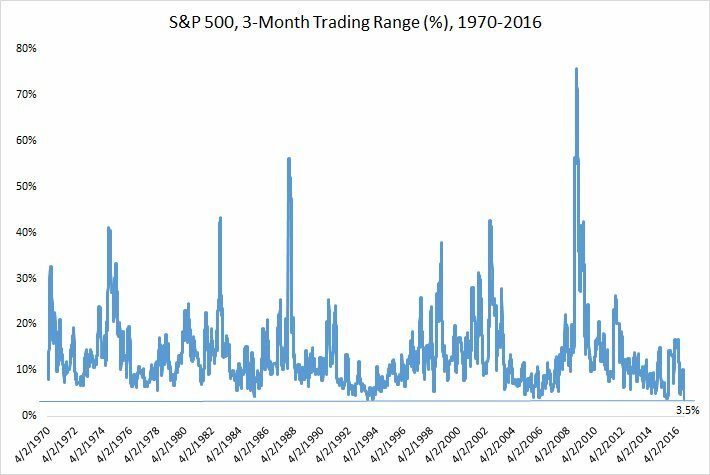 Bottom line: The 3-month trading range of the S&P500 is at a historical low, but it probably wont stay there for too long. 10. What leverage problem? 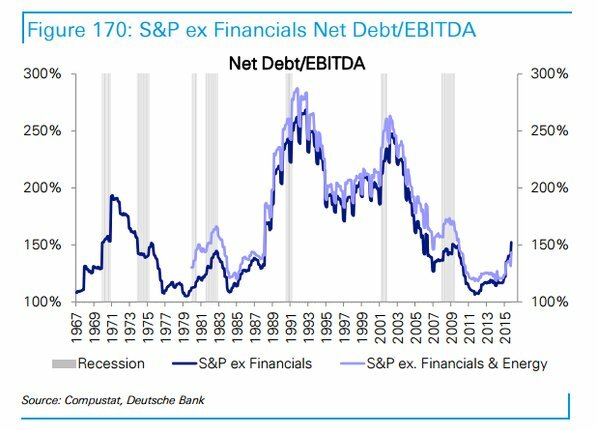 : This chart (VIEW LINK) shows the net debt to EBITDA ratio for S&P500 companies excluding financials (because financials are there own special case when it comes to leverage and debt). The key point is that it doesn't look that bad, in fact on this view, it looks like companies are much less leveraged up than in the previous decade... although that is starting to change. Bottom line: Another view of corporate leverage shows companies don't look that highly geared, but it is ticking up. The first 4 charts paint a picture of weak internals as breadth and one measure of sentiment remain locked in a downtrend. It shows weak underlying momentum and a wall of worry. The problem is the logical conclusion of those downtrend lines would be a deeper and broader market correction. The bright side is an upside break of those downtrends (particularly if you got confirmation on all of them) would be quite bullish. The other side of the coin is a selection of chart which appear to be bullish e.g. the collapse and slow recovery in bullish sentiment, the commencement of positive seasonality, and the improving path of earnings growth. Given the presence of these ostensibly bullish factors, the previous comment about an upside break of those trendlines - a climbing of the wall of worry, would be all the more bullish. The downtrends in market breadth show weak underlying momentum and a market that is vulnerable to a deeper and broader correction... But, there are some reasons to get bullish, and a key catalyst or trigger would be an upside break of those aforementioned downtrend lines; particularly if it came with confirmation on all four. So given these cross currents, and the proximity of the election... tread with caution, and good luck!